Varsity baseball defeated fourth-seeded Rutgers Prep 6-1 yesterday afternoon to advance to the semifinals of the NJSIAA South Jersey, Non-Public B tournament. Cameron Miller '17 pitched a complete game, scattering five hits and allowing only one run. Freshman A.J. 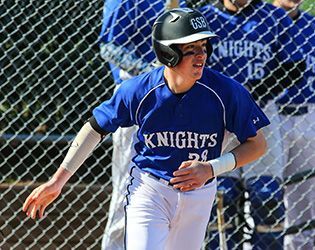 Donofrio (3-for-4, 3 RBI) got the Knights on the board with a single in the second inning, scoring Ryan Chestnutt '16, who had doubled. Neil Ianniello '16 (2-for-4, 3 RBI) laced a two-out, two-run double in the fifth to snap a 1-1 tie. Dan Sivolella '16, Matt Taylor '16, Cameron Gateman '17 and Ryan Morash '18 helped pace the offense with two hits apiece, while George Stiuso '16 scored twice for GSB.